There is something so comforting about a big bowl of seafood pie. Melt the butter in a pan. Add in the chopped leek and garlic. Sauté for 2-3 minutes without colouring. Stir in the flour and mix well. Pour in the wine, if using and reduce by half, add the stock and bring to a simmer. Tip the fish mix into the simmering stock and then stir in the milk and parsley (if using). Cover and simmer gently for 2-3 minutes until the fish is cooked through. Transfer into a large ovenproof dish (alternatively you could use a series of individual bowls). Meanwhile place the potatoes into a medium sized saucepan, cover with water and bring to the boil. Allow to simmer until the potatoes are tender. Strain off the water and allow to steam. Mash in the butter and the egg yolk and mix well. Pour or pipe on top of the fish mixture and pop into the preheated oven. Cook for 20-25 minutes until bubbling and golden brown. 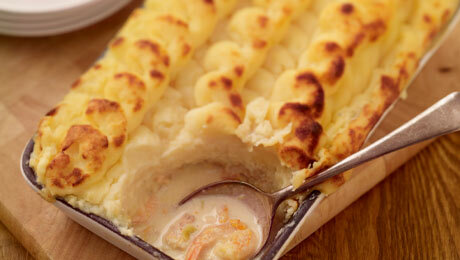 To serve, bring the fish pie straight to the table with a separate bowl of salad and allow everyone to help themselves. Yum , it is a lovely dish. Fantastic and so easy. Made this pie - delicious - thank you. Hi Kate. The wine is optional so the recipe will work fine if it is not added in. Hope that helps. Hi Kevin, if i am are not using wine do i put in extra stock? I use this fish recipe again and again. Great for kids! Bought most of the ingredients in SV Ballybunion. Unfortunately they didnt have the recommended wine, however the lady in charge of wines chose a lovely wine for me. They didn't have the fish mix so I used a stock instead. All in all it was fantastic and shock horror.... my 9 year old son ate it too. Now thats NEWS !!! Many thanks. Hi Margaret, adding wine is optional but 1 medium sized glass of wine will do. Hope this helps.